Today is National Fettuccine Alfredo Day! Whaaa??? 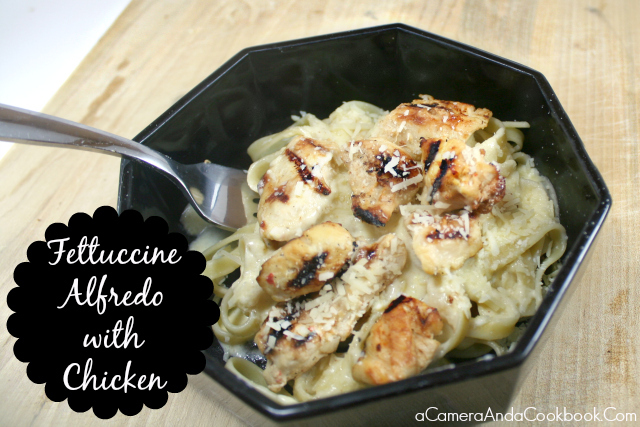 With that being said, I thought I’d share my recipe for this Fettuccine Alfredo with Chicken. This sauce is smooth and creamy. I think the key to making this meal a step above this dish is to marinate the chicken! I simply marinate the chicken in Italian dressing. 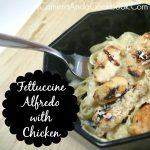 This give it a nice flavor that’s goes nicely with the Alfredo sauce and it’s not too overbearing. If you prefer shrimp in your Alfredo, those can be marinated as well. 1. Marinate the chicken the night before. 3. Heat grill to medium high heat. Spray with non-stick spray and put chicken on grill. 4. In a large sauce pan, add butter and allow to melt on medium high heat. Pour in heavy cream and bring to a simmer. Stir and add in pepper, garlic, and about half the cheese. Stir and allow it to melt. 5. Add in egg yolks and whisk quickly, allowing the yolk to mix in with sauce. 6. Pour in the rest of the cheese and stir. If you’re sauce is not as think as you’d like add in a little bit of the flour. I’d rather my sauce be thicker than thinner, so I usually add in all of the 1/4 of a cup. Stir that in. 7. When you’re chicken is cooked all the way through with those pretty little grill marks, you can assemble your meal and serve. Make sure to keep the sauce warm and stir before serving to ensure that the sauce doesn’t become gelled. Heat grill to medium high heat. Spray with non-stick spray and put chicken on grill. In a large sauce pan, add butter and allow to melt on medium high heat. Pour in heavy cream and bring to a simmer. Stir and add in pepper, garlic, and about half the cheese. Stir and allow it to melt. Add in egg yolks and whisk quickly, allowing the yolk to mix in with sauce. Pour in the rest of the cheese and stir. If you're sauce is not as think as you'd like add in a little bit of the flour. I'd rather my sauce be thicker than thinner, so I usually add in all of the ¼ of a cup. Stir that in. When you're chicken is cooked all the way through with those pretty little grill marks, you can assemble your meal and serve. Make sure to keep the sauce warm and stir before serving to ensure that the sauce doesn't become gelled.